As the weather gets warmer naturals are finally letting go of their protective styles and being free with their hair. Wash n’ gos, twist outs, braid outs, bantu knots outs – you name it, it’s out! And while we’ve done away with our winter hibernation styles and embraced the freedom of summer, there is a common issue that seems to come up time and time again. Another “F” word that for some is not the desired style. That word is FRIZZ. Now for some of you frizzy hair may not bother you and you embrace it fully. I’m one of those naturals who loves to see what my style morphs into from one day to the next if I leave my hair alone. And towards the end of the wash week the curls that I worked hard to define are a little less so. And I’m okay with it. However if you want sleek, ultra defined curls all of the time then read on! There are a few reasons for frizz. One of them is that it’s just your hair texture. The wavier and curlier your hair is, the more likely it is to frizz. So type 4 hair is more likely to be frizzier than type 2 and 3 hair. Your hair texture and curl pattern is genetically determined so if you naturally have a hair type that frizzes, you’ll need to work harder to reduce it. Hair’s chemical structure makes it susceptible to changes in the amount of hydrogen present in the air, which is directly linked to humidity. Most of the hair is made up of long keratin proteins and they can be chemically bonded together in two different ways. Molecules on neighboring keratin strands can form a disulfide bond in which two sulfur atoms are covalently bonded together. This type of bond is permanent and is responsible for the hair’s strength It isn’t affected by the amount of humidity in the air. But the other type of bonding between adjacent keratin proteins is a hydrogen bond, and it’s much weaker and temporary. Hydrogen bonds break and new ones form each time your hair gets wet and dries again. This is why the definition you get from a twist-out will pretty much stay that way until the style is disrupted by dampness. Humid air has more water vapour than dry hair and a given strand of hair can form much higher numbers of hydrogen bonds on a humid day. When a lot of bonds are formed between the keratin proteins in a strand of hair, it causes the hair to fold back on itself at the molecular level at a greater rate. Textured hair is more susceptible to water absorption from the atmosphere because it is naturally more porous than straight hair. Once hair is exposed to high humidity environments the cortex can swell causing cuticle scales on the hair shaft to lift contributing to frizz. The key to reducing frizz in any type of weather is to understand your hair type and texture, the environment you’re in, and the products you’ll want to use. There are two approaches you can take when your hair begins to puff up. You can embrace it or fight it. If you choose to counter frizziness there are a number of products you’ll want in your arsenal. Products to control frizz create a barrier to better control the movement of moisture and keep it where it needs to be—either on the outside or on the inside. Silicones are a family of polymers originating in mineral quartz or silica. The addition of various functional groups results in a variety of silicones with different properties. This information isn’t to discuss whether or not you should use silicones in your hair care regimen. It’s up to you to educate yourself about these ingredients and determine if they’re right for you. The point is that there may be a place for them in your regimen depending on your goals. The molecular structure of silicones gives them some desirable properties for textured hair care. There are various types of silicones and the properties vary depending on the type of silicone used in the formula. They spread evenly onto the surface of the hair and creates lightweight films. They can reduce friction and tangling, make the hair look glossy and shiny, soften, help with colour retention and enhance curl definition. Some types of silicones can help with damage repair and they’re great for protecting the delicate hair strands from heat damage. The benefits don’t sound so bad do they? So if you’re attempting to reduce frizz silicones may be an ingredient you want to try. It’s important to note that not all silicones are created equally and you’ll want to research and try various types and combination to determine what will best on your hair. Some silicones are heavy; others a light and flexible offering varying degrees of conditioning and detangling. Humectants are used in hair and skin care products to promote moisture retention. They have the ability to attract water from the atmosphere. Many different molecules have the ability to be effective humectants. How well they do this depends on how many water-loving sites they contain for hydrogen bonding with water molecules. The strength of this bonding between the humectants and water improves moisture retention by minimizing water loss due to evaporation. Because of their water-binding abilities humectants are ideal for dry, thirsty hair. With high humidity conditions such as warm or hot summer air, there can often be A LOT of moisture in the air. Some moisture is good; a lot of moisture – not so much. If your textured hair is dry, damaged and overly porous it can absorb a lot of water from the air. This can lead to swelling of the hair shaft, lifting of the cuticle, tangling and frizz. If you use a product that is high in humectants (especially glycerin) and you have a situation where a lot of water is attracted to the surface of the hair. This can lead to hair that always feels wet, takes forever to dry and is a sticky, tangled mess. In other words, cotton candy hair. Not hot at all! So in order to minimize the entry of water into the hair, ANTI-HUMECTANTS should be used. 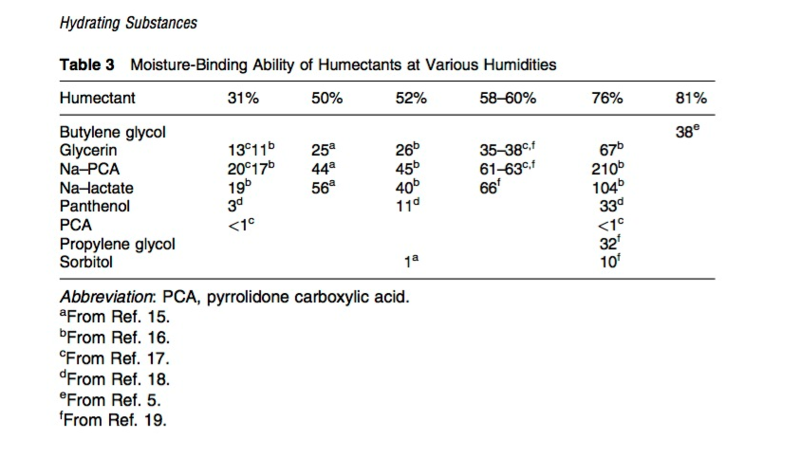 Anti-humectants should be high up in the ingredient list of a frizz-fighting formula in order to do the job. In many products silicones are used to fulfill these requirements. Esters are another class of ingredients that do the trick. If you’re looking for more natural ingredients, look no further than good old beeswax. You can also use hydrogenated castor oil, olive oil and shea butter. Cheap and effective but not so much on the natural side is good old hair grease. Blue Magic, Dax, Royal Crown – the choice is yours! Yes, petroleum based products CAN be use if you’d like. They’re extremely effective at locking moisture into MOISTURIZED hair and repelling water from getting into the hair when you don’t want it to. For your style to have staying power you’ll likely need to use a product with some hold. Polymers, especially film-forming polymers are excellent at doing this. 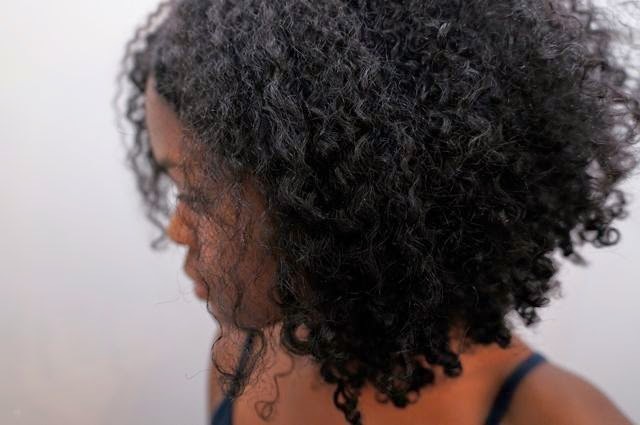 Check out How to Get Ultra-Defined Curls That Last for a very in depth discussion of how these ingredients work and which ones are ideal for your hair type and texture. I love, love, love humectants. They make my hair super soft and ultra moisturized. However if I’m going for sleek and defined over super textured and funky I may need to minimize the use of them. So in order to minimize frizz, choose products with humectants that don’t have strong water-binding capabilities and ensure the humectants are high on the ingredient list. Keep in mind that you may implement most or all of these tips and still have some frizz to your hair. It’s okay! I’ve found it best to try to work with my hair instead of against it for the most part and let it do what is does! Do you fight the frizz? What do you do?